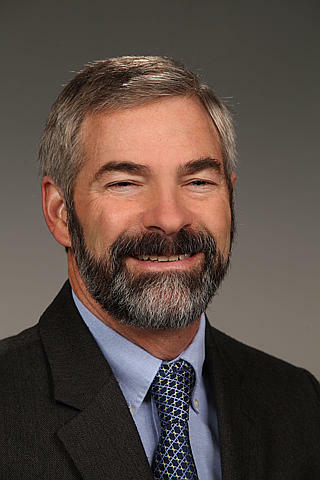 Jim De Yoreo is Chief Scientist for Materials Synthesis and Simulation Across Scales at PNNL and an Affiliate Professor of Materials Science and Engineering and of chemistry at the University of Washington. He received his Ph.D. in Physics from Cornell University in 1985. Following post-doctoral work at Princeton University, he became a member of the technical staff at Lawrence Livermore National Laboratory in 1989, where he held numerous positions including Director of the Biosecurity and Nanosciences Laboratory, and Deputy Director of the Laboratory Science and Technology Office. He joined Lawrence Berkeley National Laboratory in 2007 where he served as Deputy and Interim Director of the Molecular Foundry. DeYoreo is a member of the MRS, APS, ACS and the AACG. He is an Editor for Bioinspired Materials, Associate Editor in Chief for Frontiers of Materials Science, and a member of the AACG Executive Committee. He has served as President and Board Member of the MRS and on committees for the National Academy of Sciences, the Department of Energy, and Congress. De Yoreo's research has spanned a wide range of materials-related disciplines, focusing most recently on in situ AFM and TEM investigations of interactions, assembly, and crystallization in biomolecular and biomineral systems. De Yoreo has authored, co-authored, or edited over 175 publications and patents. He is a recipient of the Laudise Prize of the International Organization for Crystal Growth, the AACG Crystal Growth Award, an R&D 100 Award, and the LLNL Science and Technology Award. He is a Fellow of the APS and the MRS and a member of the Washington State Academy of Sciences. Hamm LM, AJ Giuffre, N Han, D Wang, J Tao, JJ De Yoreo, and PM Dove. 2014. "Reconciling disparate views of template-directed nucleation through measurement of calcite nucleation kinetics and binding energies." Proc. Nat'l Acad. Sci. 111:1304-1309. De Yoreo JJ, S Chung, and RW Friddle. 2013. "In situ AFM as a tool for investigating interactions and assembly dynamics in biomolecular and biomineral systems." (Invited Review) Adv. Func. Mat. 23:2525-2538, Inside Cover. De Yoreo JJ. 2013. "Nucleation: More than one pathway." Nature Materials 12:284. Habraken WJEM, J Tao, LJ Brylka, H Friedrich, AS Schenk, A Verch, PHH Bomans, PM Frederik, J Laven, P van der Schoot, B Aichmayer, G de With, JJ DeYoreo, and NAJM Sommerdijk. 2013. "Ion association complexes unite classical and non-classical theories for the biomimetic nucleation of calcium phosphate." Nature Comm 4:1507. (JJ De Yoreo and NAJM Sommerdijk were co-corresponding authors). Nielsen LC, JJ De Yoreo and DJ Depaolo. 2013. "Co-dependent calcite growth kinetics, inhibition and impurity uptake." Geochim Cosmochim Acta, 115:100-114. Wallace AF, LO Hedges, A Fernandez-Martinez, P Raiteri, S Whitelam, GA Waychunas, JD Gale,JF Banfield, and JJ De Yoreo. 2013. "Microscopic evidence for liquid-liquid separation in supersaturated CaCO3 solutions." Science 341:885-889. Friddle RW, A Noy, and JJ De Yoreo. 2012. "Interpreting the widespread nonlinear force spectra of intermolecular bonds." Proc Nat'l Acad Sci 109:13573-13578. Li D, MH Nielsen, JR Lee, C Frandsen, J Banfield and JJ De Yoreo. 2012. "Direction-specific interactions control crystal growth by oriented attachment." Science 336:1014-1018. Shin SH, S Chung, B Sanii, CR Bertozzi and JJ De Yoreo. 2012. "Direct observation of kinetic traps associated with structural transformations leading to multiple pathways of S-layer assembly." Proc Nat'l Acad Sci 109:12968-12973. Chen CL, J Qi, RN Zuckermann, and JJ De Yoreo. 2011. "Engineered biomimetic polymers as tunable agents for controlling CaCO3 mineralization." J Am Chem Soc Comm 133:5214-5217. Chen CL, K M Bromley, J Moradian-Oldak, and JJ DeYoreo. 2011. "In situ AFM study of amelogenin assembly and disassembly dynamics on charged surfaces provides insights on matrix protein self-assembly." J Am Chem Soc 133:17406-17413. Cho KR, Y Huang, M Plomp, R Qiu, MS Sy, and JJ De Yoreo. 2011. "The formation pathways of β-oligomers and subsequent nonfibrillar aggregates of recombinant human prion proteins." J Am Chem Soc 133:8586-8593. Friddle RW, K Battle, V Trubetskoy, J Tao, EA Salter, JJ De Yoreo, and A Wierzbicki. 2011. "Single-molecule determination of the face-specific adsorption of amelogenin's c-terminus on hydroxyapatite." Angewandte Chemie Int Ed 50:7541-7545. Chung S, SH Shin, CR Bertozzi, and JJ De Yoreo. 2010. "Self-catalyzed growth of S layers via an amorphous-to-crystalline transition limited by folding kinetics." Proc Nat'l Acad Sci 107:16536-16541. Friddle RW, M Weaver, SR Qiu, A Wierzbicki, WH Casey, and JJ De Yoreo. 2010. "Sub-nanometer AFM imaging of peptide--mineral interactions links clustering and competition to acceleration and catastrophe." Proc Nat'l Acad Sci 107:11-15.